John Lincoln Eisele was born January 18, 1884 in Newark. He grew up in the city’s wealthy Forest Hill district. John was light-hearted, optimistic and well-liked by his classmates at Newark Academy. He did not play any particular sport there. However, he had great stamina and had a wiry 5’10” 150-pound frame that was perfect for distance running. John enrolled at Princeton University to prepare himself for a career in finance and captained the track team as a senior. Although he did not stand out as a dominant runner, his smooth stride enabled him to break the tape in many races as an upperclassman. After graduating, John joined the New York Athletic Club and began shaving seconds off his middle-distance runs. In 1908, John entered the AAU championship in the 10-mile race and won. The longer or more strenuous a race, the better he tended to do. He was intrigued by the prospect of testing himself in the Olympics. The 1908 Summer Games would be the first time a majority of the world’s track athletes would compete in the same place at the same time. As cross-country transportation was expensive and challenging, the U.S. Olympic trials that spring were held in Philadelphia, Chicago and at Stanford University in California. John’s favorite distance event, the 3,200 meter steeplechase, was only held in Philadelphia. He and fellow NYAC member George Bonhag entered the race. John completed the course in 10 minutes 47 second to win and earn a trip to London. John’s main competition in this race would come from Arthur Russell, a bricklayer, and Arthur Robertson, a doctor’s son who had gained fame as a cyclist before an accident. Russell set the pace, with John a few steps behind until the final lap. When the bell rang Robertson passed John and challenged Russell, who barely held him off. John was out of gas and finished a distant third, 13 seconds off his Philadelphia time. 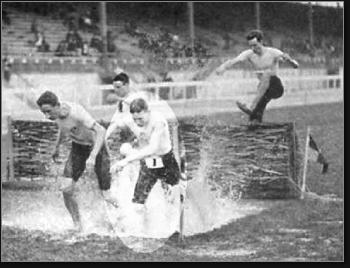 The 1908 Summer Games marked the first and only time the 3,200 meter steeplechase was run. Therefore John’s bronze medal was truly one of a kind. John also competed for the U.S. in the 3-mile team race. This competition saw five runners from each country start, but only the top three finishers would be counted in a team’s final score. John found himself trailing the Brits again, including Russell, who took the top three spots to win the gold. John finished fourth, helping the U.S. win silver. John returned to America and joined his father’s stock brokerage firm, Eisele & King, in Newark. He joined the Essex Troop of the state cavalry and lectured at area YMCA’s on the value of sports. He was also an accomplished polo player. John married in 1912 and became a wealthy man during the stock market boom of the 1920s, but was overleveraged when the market crashed and lost much of his fortune. Despite these setbacks he remained ever cheerful to his friends and family…until he shot himself and died at the age of 49.